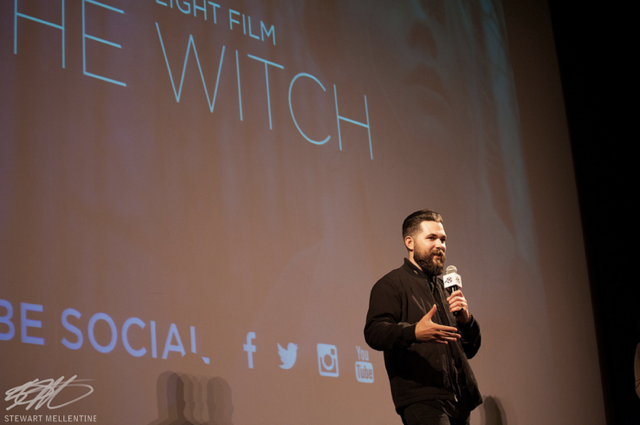 For its final festival screening before hitting theaters this coming February, director Robert Eggers returned to his home state to screen his film “The Witch” at last weekend’s New Hampshire Film Festival. “The Witch,” which won Eggers the Best Director award at this year’s Sundance Film Festival, tells the story of a family of Puritan settlers in 17th century New England who leave the safety of their plantation to build a life for themselves on the edge of a dark and foreboding woods. As ominous events continue to plague the family, and only escalate in severity, the family realizes they may be fighting more than the harsh, impending winter. Playing to a packed theater, Eggers took the stage to discuss the film’s production, reception and upcoming distribution. “When it came to the writing of this piece, it came from the source material. What was really interesting about the research, was that aside from the extreme intelligentsia, the fairy tale world and the real world were the same thing. We looked at fairy tales and folk tales, but also diaries and accounts of real witchcraft and court records, and you see the same tropes throughout, the same witch. It was really cool to realize that doing a fairy tale as if it could really exist was the most realistic portrayal of the 17th century that the layperson would have experienced. If I could take a Puritan’s nightmare as I would envision it and upload it into the audience’s mind’s eye, that was the goal. “Also, I was very fortunate, given my budgetary level, to have a week of rehearsals where we really worked together to build this family so there would be love there. That way, we could see this family fall apart. When I was younger, I used to think it was kind of cool to abuse actors mentally, but I really disagree with that now. If you’re going to explore these dark places, you have to be able to climb back out, otherwise you’re damaging people.